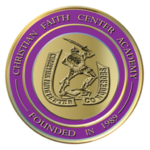 The mission of Christian Faith Center Academy is to produce students of Christian character and academic excellence to impact our world. We strive to educate the whole student, academically, spiritually, and emotionally. The Bible says in Proverbs 22:6 to “train up a child in the way that he should go and when he is old, he will not depart from it.”We infuse our curriculum with Biblical principles and Christian perspective, so that our students will learn the way a Christian should respond to the world around them. Our prayer is that this will ultimately cause them to make a great impact on this world.